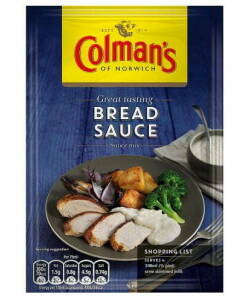 Colmans Mustard Powder- 4oz - Brits R U.S.
Jeremiah Colman first created his fiery blend of brown and white mustard at a Norfolk water mill in 1814. Ever since, our matchless mustard has gone from strength to strength – with a Royal Warrant from Queen Victoria as our crowning glory. 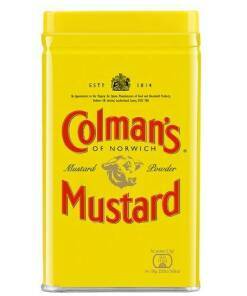 Today as much as ever, we pride ourselves on producing the finest quality, quintessentially British mustard. You can visit the Colman’s Mustard shop and Museum which has been created in the replica Victorian premises, in Norwich today. 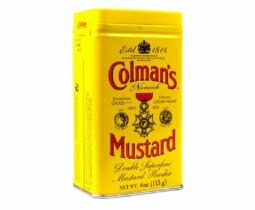 To make up Colman’s Powder Mustard, to serve as a simple condiment with food, only cold water should be used. Mix with equal quantity of water and allow 10 minutes standing time to allow the full flavour to develop. The water acts as a catalyst that helps yield the essential oil of mustard which produces that unmistakable taste. Adding a pinch or two of dry mustard to perk up a vinaigrette dressing or add some to a mayonnaise to make a tasty dip.